Connecting people to cheesemakers and delicious handmade cheese in Western North Carolina, is what we are all about. ﻿Spend an afternoon or a weekend exploring the country roads of beautiful Western North Carolina and sample some of the best cheeses being made in the south today. The WNC Cheese Trail (501c6) allows you to connect directly with cheesemakers, see where your favorite cheeses are crafted, and buy straight from the producers. You will find cow and goat milk cheese, fresh to aged, pasteurized and raw, as well as artisan and farmstead producers. The cheesemaking community in WNC is vibrant and growing—come see for yourself. 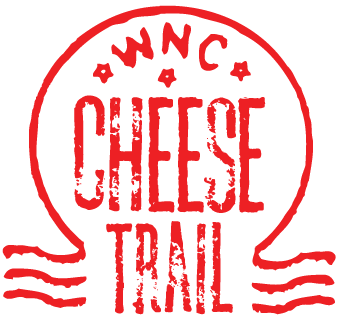 The WNC Cheese Trail is a cooperative effort by the region’s farmstead and artisan cheese producers to promote the production and sale of WNC artisan cheeses, facilitate consumer education, and encourage tourism to the region to benefit member producers. NEWS & SPECIAL EVENTS - Click on the cows above to sign up to receive updates, information and invitations to special events!